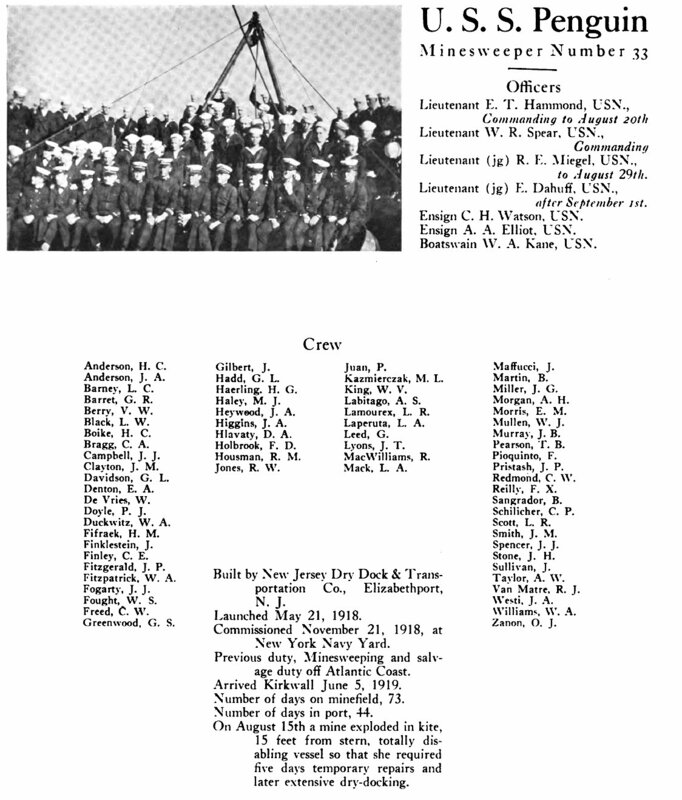 Scuttled by her crew 8 December 1941 in 200 fathoms at Agana Harbor, Guam to prevent capture by the Japanese. Propulsion: Two 200psi saturated steam Babcock and Wilcox header boilers, one 1,400shp vertical triple expansion reciprocating steam engine, one shaft. 173k Liberty party gathered on the ship's stern, preparing to go ashore after reviewing the Fleet in New York Harbor, 26 December 1918. 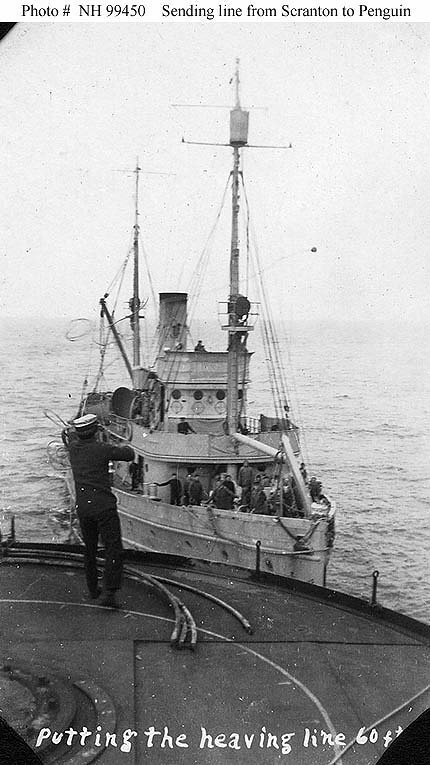 79k Close astern of USS Scranton (ID 3511), as a Chief Petty Officer is "putting the heaving line 60 ft." between the two ships, circa 28 March 1919. Note the line's weight in the air above Penguin's bow. 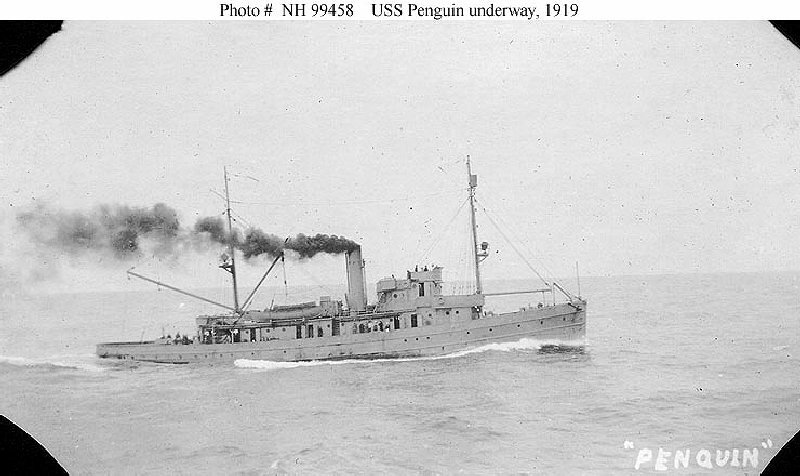 73k Underway near USS Scranton (ID 3511), probably circa 28 March 1919. Photograph from the USS Scranton photo album kept by J.D. Bartar, one of her crew members. 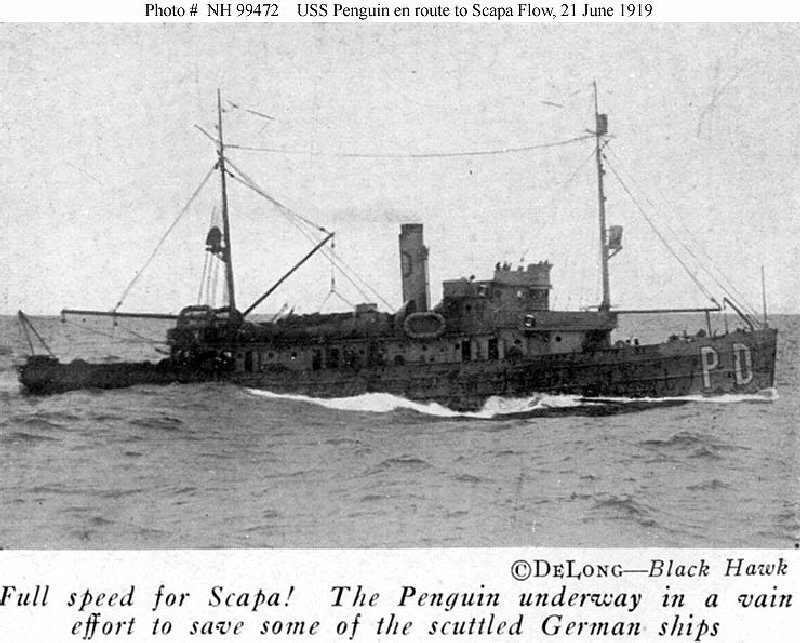 116k Steaming at full speed for Scapa Flow, 21 June 1919, during an unsuccessful effort to arrive in time to save some of the German warships scuttled there on that day. Note the identification letters "PD" on her bow. Halftone reproduction of a photograph taken by DeLong, of USS Black Hawk [ID 2140], published in the cruise book "Sweeping the North Sea Mine Barrage, 1919", page 38. Donation of Chief Storekeeper Charles A. Free. 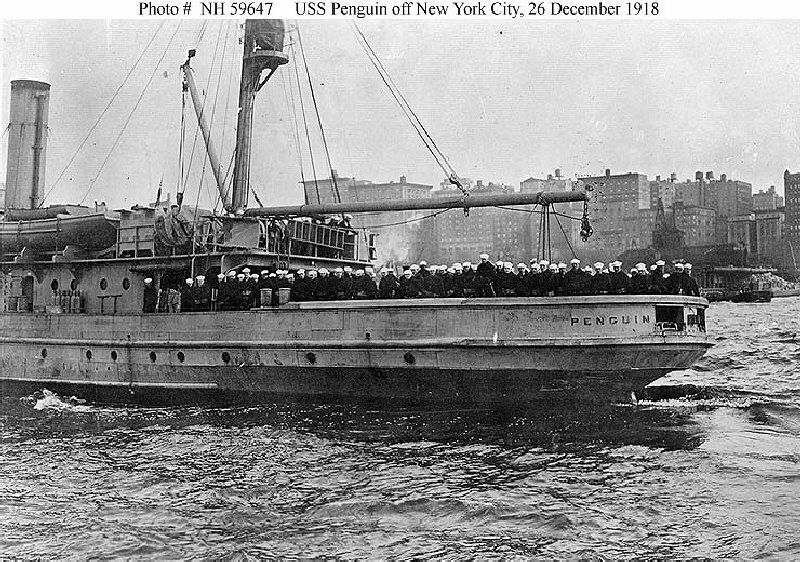 107k Penguin, at left and USS Lapwing (Minesweeper # 1), "Coming up to repass" sweep gear, after exploding a mine during the sweeping of the North Sea Mine Barrage in 1919. Note the identification letters on the ships' bows: "PD" on Penguin and "W" on Lapwing. Halftone reproduction of a photograph taken by DeLong, of USS Black Hawk [ID 2140], published in the cruise book "Sweeping the North Sea Mine Barrage, 1919", page 59. 80k "The Buoy Laying Division in Kirkwall Harbor." From left to right, in center: USS Osprey (Minesweeper # 29), Penguin, and USS Lapwing (Minesweeper # 1) moored together in Kirkwall Harbor, Orkney Islands, during the sweeping of the North Sea Mine Barrage, 1919. Note the identification letters on the ships' bows: "A" on Osprey, "PD" on Penguin and "W" on Lapwing. Halftone reproduction of a photograph taken by Kitress, of USS Swan [Minesweeper No. 34], published in the cruise book "Sweeping the North Sea Mine Barrage, 1919", page 63. 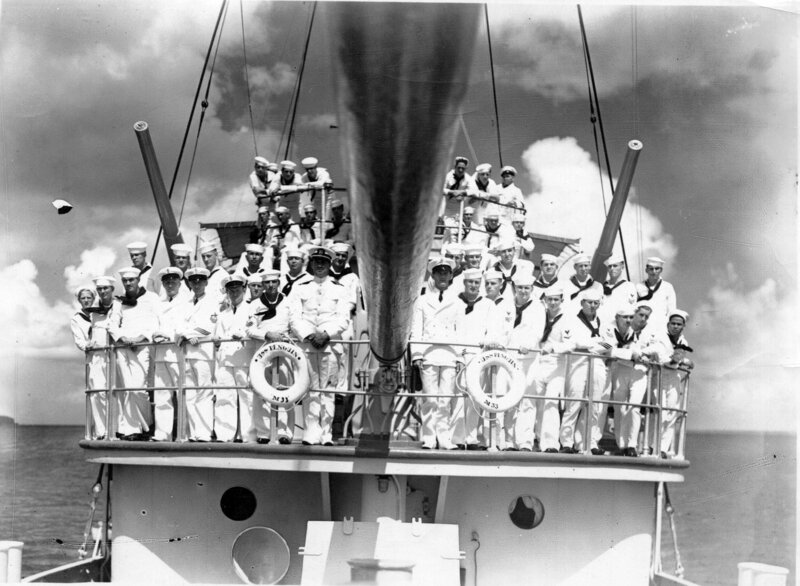 267k Original photo: Ship's Officers and Crew, 1919. Halftone reproduction of a photograph, published in the cruise book "Sweeping the North Sea Mine Barrage, 1919", page 137. 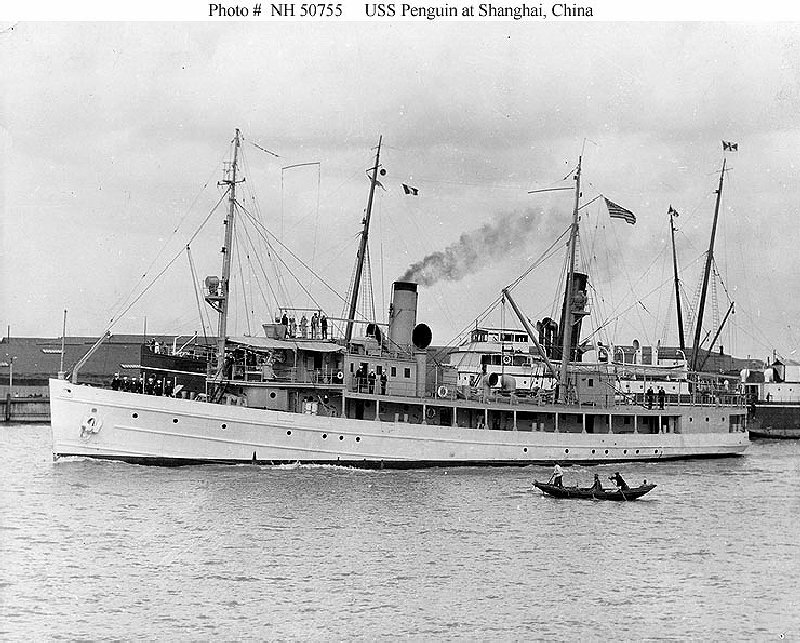 147k Underway off Shanghai, China, circa the later 1920s, following conversion for river gunboat service.